When I saw the call for participation for an attempt to break the Guinness World record for the Longest Soul Train Line in Oakland on June 20, I hesitated not one second before clicking through to sign up. In the words of one man interviewed at the event by the San Jose Mercury News, "Funk-related world's records are not that numerous, frankly," and for this one, I had trained basically every Saturday afternoon in the 1970s with my older sister on the red shag carpet in the family living room, with Soul Train playing on the tv set. If you didn't watch it as avidly as I did: the Soul Train line came at the end of the broadcast, when dancers lined up across from each other to shimmy side to side in a dance gauntlet, while the two dancers at the top of the line showboat their way down the center. Sometimes it was a choreographed dance, sometimes it was improv, but as Soul Train host Don Cornelius would say, it was all "Love, peace, and souuuuuuuuullll." To participate in the Oakland event you had to be capable of dancing 3+ hours without a break, or as we used to call that in the '80s, a Tuesday. The event was a fundraiser for the many children's programs at De Fremery Park in West Oakland, a day after the Golden State Warriors held their NBA Finals victory parade around nearby Lake Merritt. It was a good weekend to be an Oaklander. My friends Dawn and Lilah also signed up, and we spent some of last week emailing about outfits and footwear and "can we seriously not take bathroom breaks because if so, I better not have coffee that morning," the kinds of dance-related worries you have past 40. I bought the most obnoxious leggings I could find at Target to wear with a fringy vest and big 70's style sunglasses and ginormous orange earrings. And sneakers. We were supposed to arrive at 6:30 am last Saturday to register; when we got there at 7:30, we only needed about 271 more people to break the record Philly had of 291 dancers. As people trickled in from all over Oakland for the next few hours, we used scissors to customize our official colored tshirts - Guinness stipulated that everyone had to stick with their color group, and we had a rainbow of ROYGBIV going on - and the DJ started spinning at 8 am so people were already dancing. This group of sisters and nieces started choreographing their moves down the football-field length course by 8:30.
to Amanda the medical marijuana clinic spokesperson who was celebrating her 39th birthday being a bad Mama Jama. There were a couple of very strict rules: dancers on the sidelines had to keep in constant motion because if you stopped the official Guinness observer would not count you. You couldn't start your dance down the center aisle until the couple in front of you had reached the end and rejoined the sideline dancers- someone stood at the end of the row with a giant piece of cardboard painted red on one side, green on the other, and you best not start down until you saw green. Finally, you didn't leave the line for anything. Not bathroom breaks, not the Chicken and Waffles or Italian ices booths that vendors set up as the sparse bystander crowd slowly morphed into a huge neighborhood party, not even if your feet were killing you from dancing on the asphalt surface of the street next to De Fremery park that had been blocked off to traffic. And then after a Warriors cheerleader who teaches a "Be Happy, Beyoncé" dance class took us through warmups, we were off and running - I mean dancing - at 10:40 am to "Ain't No Stopping Us Now." First down the line was Chocolate Platinum and her dance ladies, including Mz. Vee and Mz. Smooth. Then came some original Soul Train dancers whose original satin Soul Train jackets we'd admired all morning. Then we settled in for the dance duration. Pretty much every dancer who came through was cheered all the way down the line, at first because we were all so excited, sometimes because of excellent or at least very unique dance moves, sometimes because the dancer looked like someone who needed cheering to make it to the end, by hour 3 because that meant one less person between us and being able to sit down on the grass of De Fremery Park with an Italian ice in hand. Turns out that as much as you enjoy watching the showboating dance moves, it takes A VERY LONG TIME to do the Robot down a football field. And heaven help the people who started backtracking toward the top of the line with their moves. The lady on stage with the mic would yell, "NO NO NO, keep moving, Blue! Keep it moving!" And of course, the 90 seconds Dawn and I took getting down the center line, high fiving fellow dancers and making that vest fringe move. Were they cheering because we were moving so fast, or because our flow was on point? Yes. Best minute and a half of my life. When they finally rang the bell midafternoon, we'd blown through Philly's record, with 331 dancers going four hours. We'd raised money for DeFremery and met a bunch of fellow Oaklanders who we wouldn't have otherwise, in the process showing that some white ladies from the Oakland Hills know from the Whip and the Nae Nae. 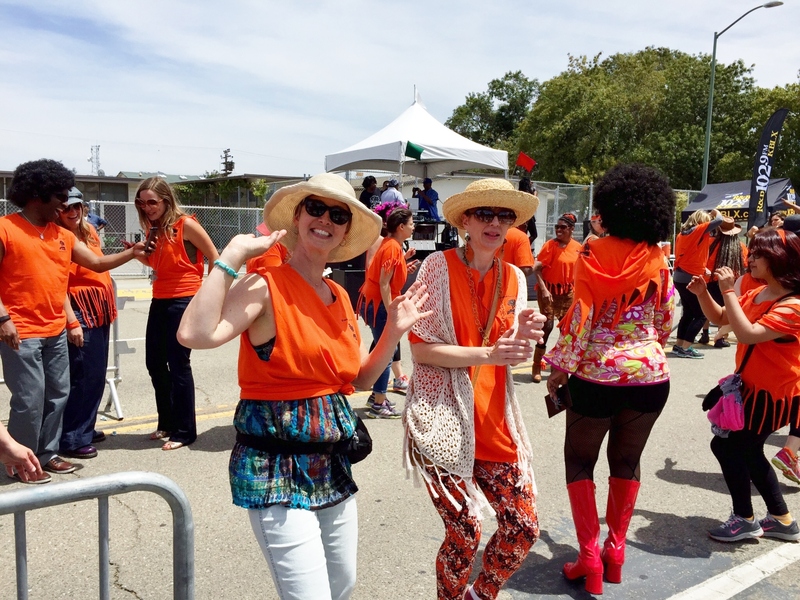 And we'd gotten to dance to "Word Up" outside on a gorgeous sunshiney day before it was even lunchtime. In a week where racial hatred resulted in a tragedy in Charleston, I had a crazy thought: what would happen if we held a four hour Soul Train line in every city in this country? Those feel-good endorphins from dancing make it impossible to do a Soul Train line without smiling at the people next to you and across from you, to yell some "Get it, girl!" and "Okay okay!" as others dance past you, whatever color shirt they're wearing or how they customize it. A national Soul Train Line Day would be a powerful reminder that we're all on the same big funky team. We're doing it for the kids. So go out, wherever you are, and break our Guinness World record. There's plenty of love, peace, and soul to spread around.